In 1964, when that other Liverpool band The Beatles was growing into the phenomenon that would become Beatlemania, Gerry & the Pacemakers were releasing their seventh single, a slow song called "Ferry Cross the Mersey." 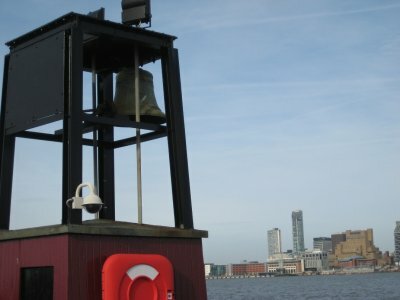 A tribute to the Liverpool area, the song implores the ferry to cross the Mersey River, to return the singer to the land he loves. 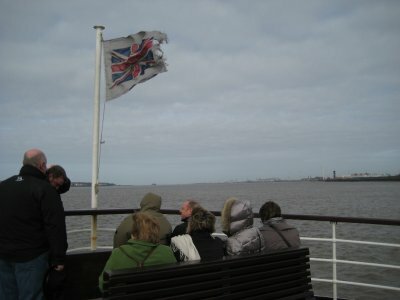 On Sunday I ferried myself cross the Mersey to see Liverpool's opposite bank - Wallasey, New Brighton and Birkenhead. 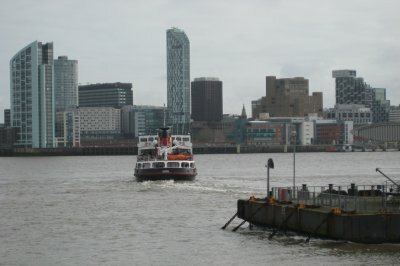 Ferries have been crossing the Mersey river for probably over 1000 years. 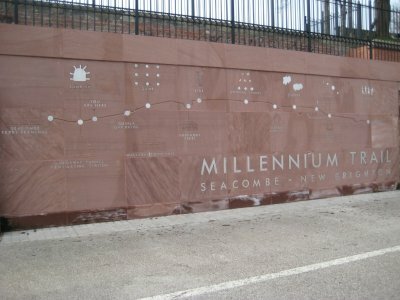 There was a record of a ferry crossing the Mersey from Seacombe in the Domesday Book in 1086. By 1150, Benedictine Monks in Birkenhead were running a ferry service. In 1330 they were granted a charter by King Edward III to run the ferries forever. They ran ferries until 1536, when King Henry VIII dissolved the monasteries and took over the license for the ferry. In the 1800s, modern ferry service began, provided by two separate companies - The Wallasey and Birkenhead companies. 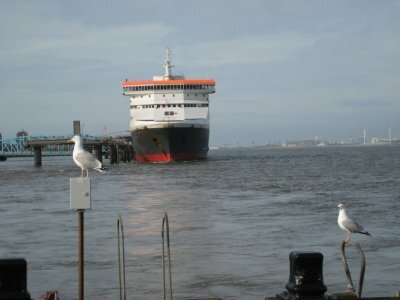 The ferry service was taken over 1968 by the Merseyside Passenger Transport Executive (also known as MerseyTravel) and the two services were merged into the single company. Wallasey tended to name their ferries after flowers, and thus to link with history one of the current ferries is named Snowdrop, though it is branded with Birkenhead colours. 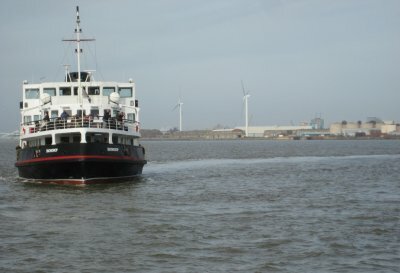 During the week at rush hour, the ferry service is a commuter service, running between the Seacombe ferry terminal in Wallasey, the Birkenhead ferry terminal and the Pierhead in Liverpool. Off hours and during the weekend, though, the ferries run River Explorer Cruises. These cruises run for about an hour, with two stops. 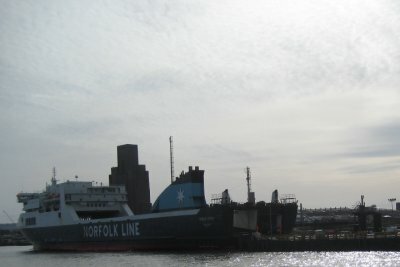 In the summer, the ferry runs downstream towards New Brighton before turning back and stopping at Seacombe and Birkenhead. 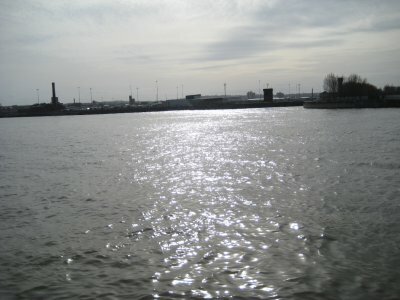 In the winter, when I took the cruise, after leaving Liverpool, the ferry stops at Seacombe and Birkenhead before running upstream towards Eastham. 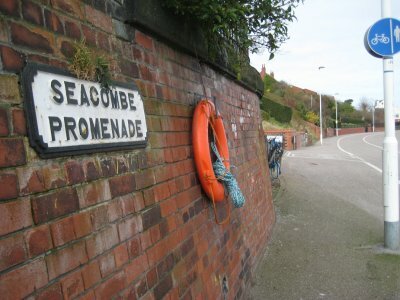 You can hop off at each of the stops and pick up a later ferry, so after crossing the Mersey, my first stop of the day was Seacombe. I was actually happy that the ferry wasn't on it's summer route, as the trip downstream to New Brighton is something that you can do by walking along the 3 kilometre long Millennium Trail. The trail is paved and flat, keeping to the river side. 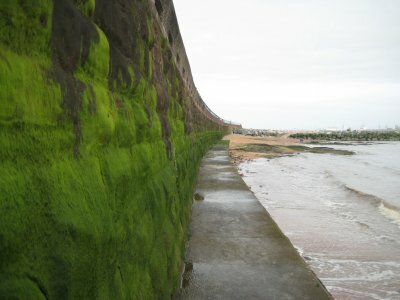 There are certain places where you can get down onto the beach (assuming the tide is co-operating with you). 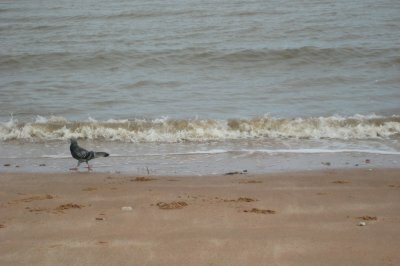 The water was cold, so even the birds were staying out of the water, instead just strolling along the water's edge. 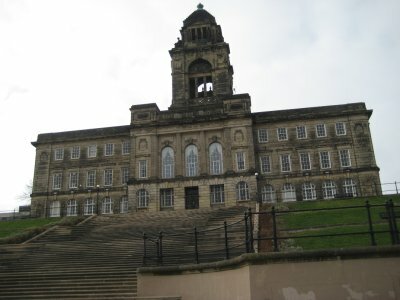 Just after leaving the Seacombe Ferry Terminal, you will see the impressive Wallasey Town Hall. The town hall was opened in 1916, and interestingly faces away from the town and out across the river. I wonder what that says about the government's opinion of it's people at that time. 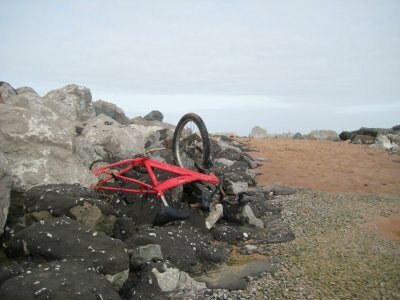 Three kilometres later, and I arrived in New Brighton. 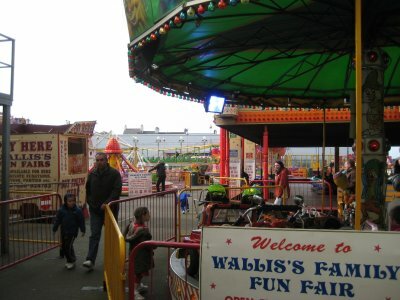 New Brighton is a seaside resort town, with the requisite seaside walk with arcade and funfair. Out on a point on the border between the Liverpool Bay in the Irish Sea and the mouth of the River Mersey sits Fort Perch Rock. 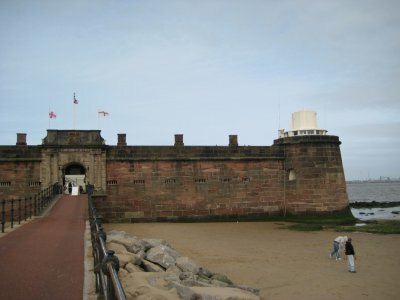 The fortress is a coastal defence battery built in 1829 to protect the Port of Liverpool. Today it is a museum. 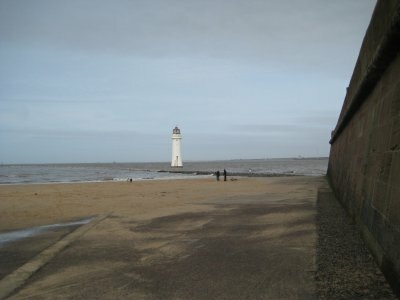 Out from Fort Perch Rock is the New Brighton Lighthouse. When I was there, the tide was high and the base of the lighthouse was underwater. 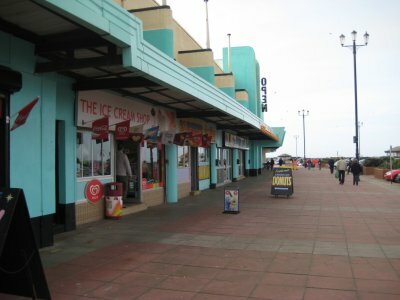 It took me about 1 hour to walk from the Seacombe Ferry Terminal to New Brighton. Ferries run every hour, so upon arriving at New Brighton, I had a choice. I could turn right around and head back to catch the ferry with a 2 hour run trip, or I could hang around in New Brighton for an hour. I choice to spend the hour, and was bored after 10 minutes. That is the problem with the ferry schedule. Either you see nothing of New Brighton, which is less than you want to see, or you see 1 hour of New Brighton, which is 50 minutes more than you want to see. I decided to head back by walking along the road instead of along the riverside promenade to see a different side of New Brighton and Wallasey. There was a few nice sites along the way. I also came across a couple street names I liked. First up, home sweet home! And then, this street. Depending on your age, you might be imaging a furry red muppet with a halo, but because I was a teenager in the 1980s, I remember the excellent Brat Pack movie, "St. Elmo's Fire," and the theme song by John Parr. For the rest of the day, I was humming the chorus to myself. I continued my motion, though via my feet and not a pair of wheels back to Seacombe Ferry in time to grab the boat to Birkenhead. Along the way we passed the car ferry terminal, where ferries leave for Belfast and Dublin. 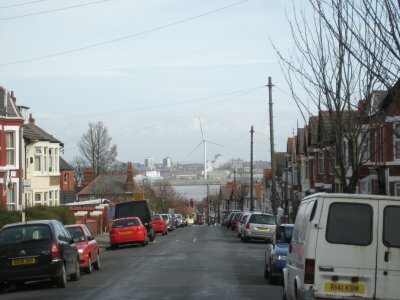 At the ferry terminal in Birkenhead, the more industrial port like nature of the Liverpool area is very visible. Downstream you can still see the Ireland ferries, and upstream there is an oil refinery and a few dry docks. 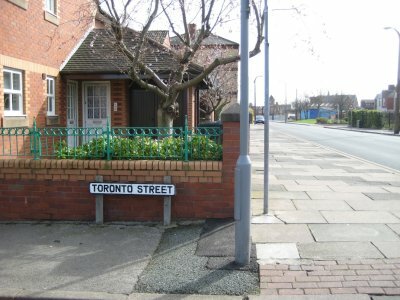 After the 6 kilometre round trip walk in Wallasey, I wasn't in for too long a trip in Birkenhead. Instead, I just took a quick jog up to the city centre, just 10 minutes on foot. Just outside the ferry terminal, I passed a double-decker wooden trolley. 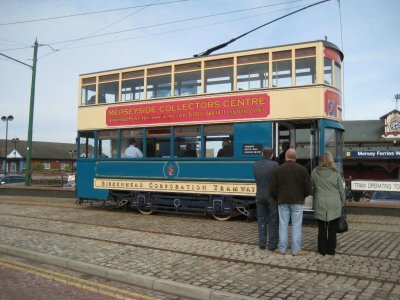 Birkenhead had the first street tramway in Europe. 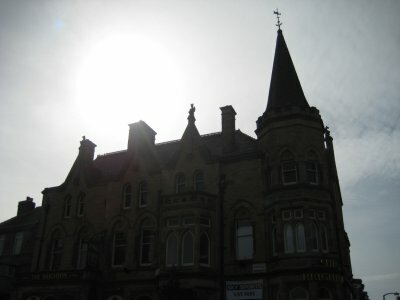 Opened in 1860 the first line ran from the Woodside ferry terminal to Birkenhead Park. This early system was horse-drawn. Today, two replica trams, imported from Hong Kong, have been brought into service as part of a heritage tramway. 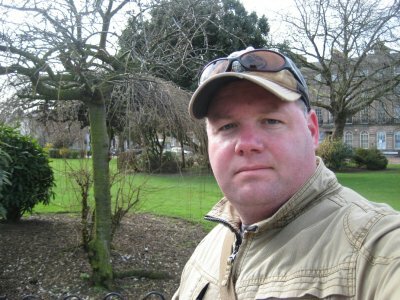 10 minutes walk up hill, and I was in Hamilton Square. 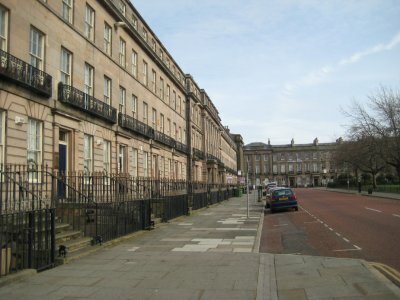 Hamilton Square built in the late Georgian and early Victorian area. 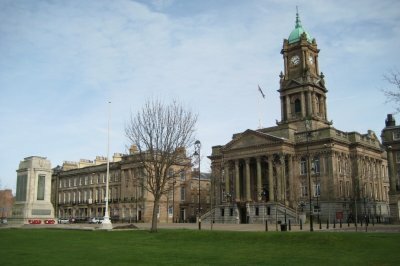 3 of the sides of the square are Georgian terrace houses, with the four side having the town hall (which is now a museum). 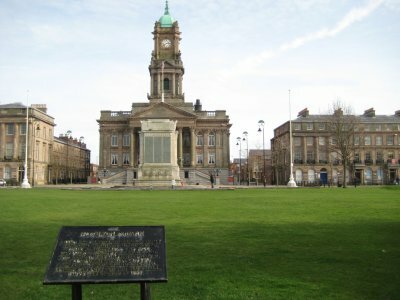 It is second only to Trafalgar Square in London for having the most Grade I listed buildings in a single square. 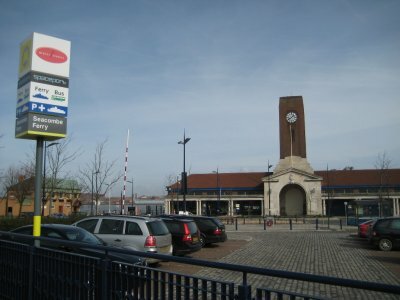 Birkenhead is connected to the underground train system called MerseyRail. 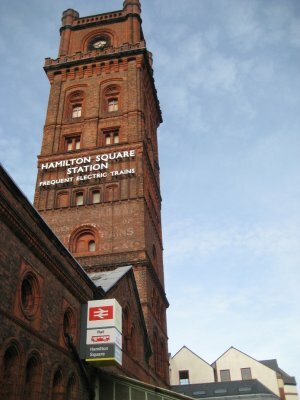 I loved the motto on this train station tower. "Frequent Electric Trains." Oh, if they are electric, then I will take one! I guess the motto probably made more sense when the choice was underground steam engines, which history documents as being very sooty and chocking. After my quick tour of Hamilton Square, I still had 40 minutes to wait for the next ferry, so looked for a place for a quick pint. 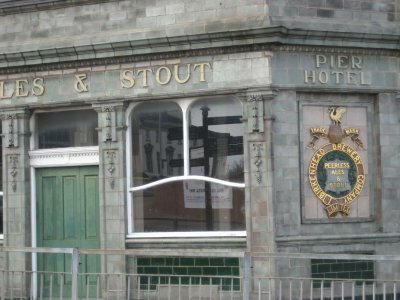 Sadly, it seemed that Hamilton Square wasn't the only thing with Victorian elements - the morals of the place must still be Victorian, as all the pubs were closed on Sunday. None for me, at least not that day. Instead I went back and sat on the river side watching the river roll by. The ferry arrived, and I completed my round trip. 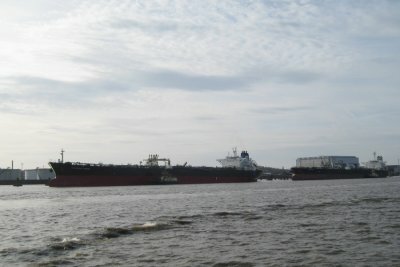 We powered upstream against a fast current to see the oil refineries, dry docks and oil tankers. 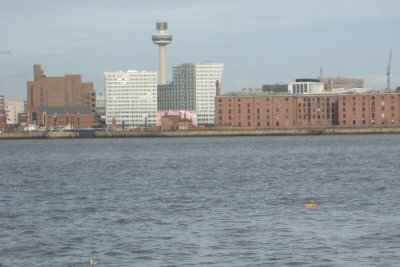 The boat finally turned back, and quickly moved downstream towards Liverpool's Pier Head dock. I took a seat on the deck and watched the sun shimmer off the River Mersey. I've always wondered what the place in the song was like, and now I feel as if I've had a visit there. Your pictures are great, and your commentary keeps one's interest. More! More! Thanks Wolgy. No more from Liverpool, but I am off on another trip this weekend, and should have some new entries to post next week.